(Huff) (huff) (huff)… “I’d better be right about this…” I thought. I was on the fifth mile of a seven mile training run, and was not love’n it. It wouldn’t have been so bad had I been following the training schedule, but I wasn’t. I was woefully undertrained. I was holding off endurance exercise as long as possible for my research because I had speculated all along that it would impact my lipid numbers. Indeed, it was my plan all along to have a long Low Exercise Phase followed by long High Exercise Phase. This way each group of blood tests could be distinct from each other to compare. I was certainly all set to find out. In just a five month span my wife and I had several runs scheduled, including four half marathons and one full marathon. So if there were differences to be found, I was pretty confident they would be showing up! Let’s take a look at the timeline before delving into the results. 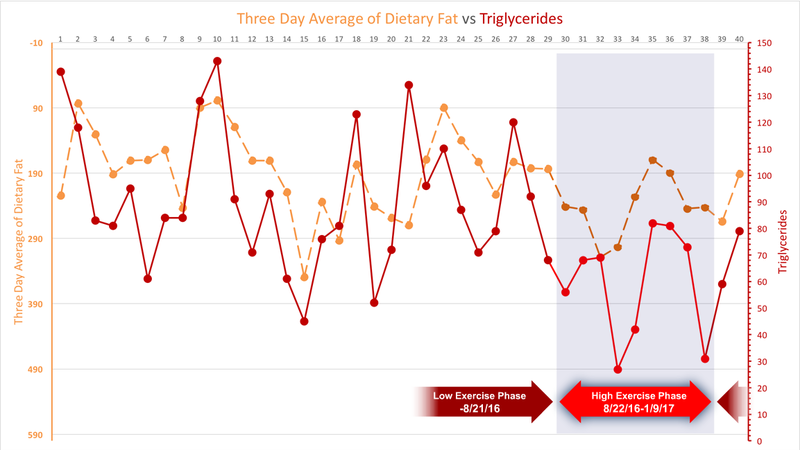 ** NOTE: I had to intentionally remain sedentary throughout Ketogains experiment given I assumed it would impact my lipid numbers and create confounders. Thus, the below graphs exclude the blood tests of October 5th, 7th, 10th, 12th 2016 given they didn’t include the exercise/training within. Okay, now let’s get to the graphs. As usual, I present the left and right axis in relative terms so you can see the obvious relationship. Thus, the one of the left starts at the bottom with -10 and goes upward to 490 with the one on the right starting at 120 and going to 400. And now we’ll flip the left axis to show the inverse correlation, so it will now start with 490 at the bottom and go up to -10. 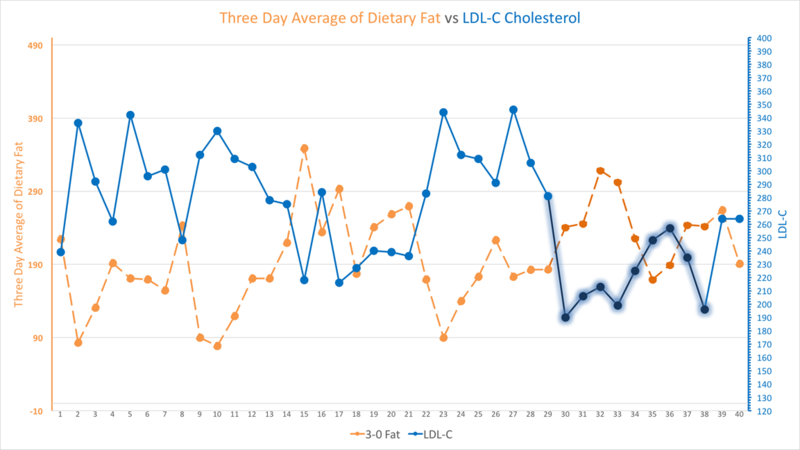 In the Low Exercise Phase in the first 2/3rds of the graph you can see the tight inverse correlation between my three day dietary fat (in dashed orange) and the resulting LDL-C score (in solid blue). Of course this is very old news to me now, but if you’re just joining us and you’re finding yourself stunned, you probably haven’t watched my recent presentation at Low Carb Breckenridge or read my series of posts regarding these patterns. Given the pattern on the left, we can see how our expected trend line pattern is as it comes into the High Exercise Phase on the right 1/3rd. And as is immediately apparent, the LDL-C trends comes in generally lower than we would expect on the Low Exercise Phase. The two largest gaps are the first data point at the very beginning phase and the last one at the end. Per my story above, the first one is the blood test following a sudden entry into the running schedule without much conditioning before it. It was miserable and I was especially sore, to no surprise. 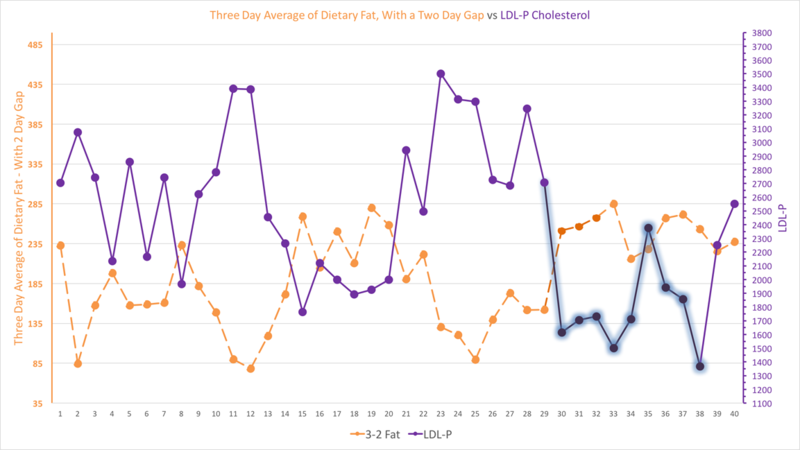 Again, LDL-P appears to have a far stronger correlation when applying a two day gap between its three day window of dietary fat and the resulting blood test. 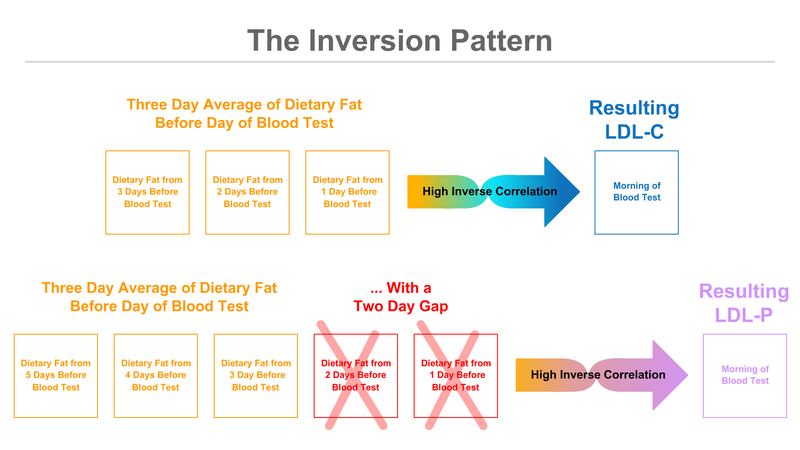 Like LDL-C, we see the first and last data points providing the largest gaps from the original Inversion Pattern. 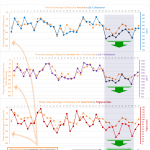 Even with all that high deviation, we can clearly tell there is a massive pull down of trigs following the major endurance events (half and full marathons) creating huge gaps in the trend lines. Early on in my research I learned about “receptor mediated endocytosis” which is basically cells engulfing lipoproteins entirely. This is commonly done so cells can use the parts that make up an LDL particle for their own repair, which includes cholesterol and phospholipids. This led me to assume (rightly, as it turns out) that there would be a drop in my lipid measurements if my body were in the process of cellular repair such as from muscle maintenance following a run, removing more of the LDL-P from circulation. 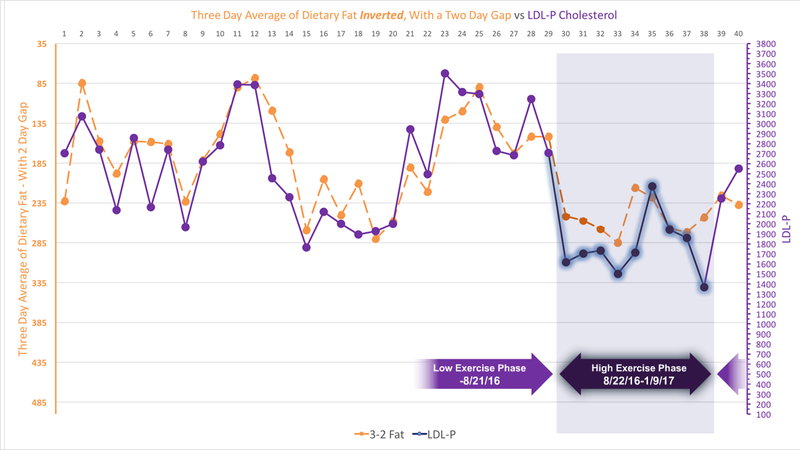 The two biggest gaps above with LDL-C and LDL-P happened to be the first and last data points. And indeed, these were the two toughest periods for me, the first where I jumped right in the middle of the training schedule and the second following the grueling marathon week. Both times I was noticeably sore on my way to the blood draw. This is also why I’ve held off on resistance training and plan to make it a phase by itself. I suspect more intensive muscle repair will likewise draw down LDL-P and LDL-C from the expected pattern. I’m sure many will read this and feel it reinforces the reason to get exercise in order to remove these elements from the blood stream. But I don’t necessarily buy into that. I think many other things about exercise are far more relevant to cardiovascular health such as increased sheer stress. So why was I so particularly interested in triglycerides? Because my body is primarily fueled by it, hello! And that’s why I speculated that my trig scores would be extremely low following the big races, which is exactly what happened! Bear in mind I would have preferred taking the blood test in the minutes following the race, but had to wait until the following day given the blood labs aren’t open on Sundays when all the long races took place. As such, there was probably an even higher level of trigs in my bloodstream due to the food I ate following the race that afternoon and evening. 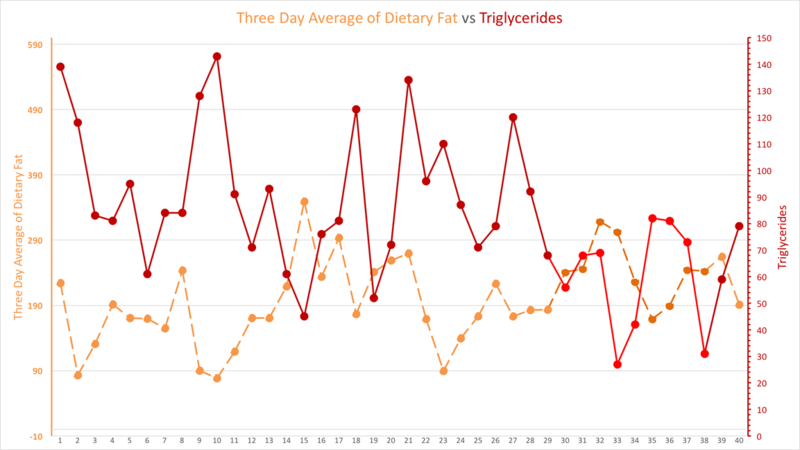 Unsurprisingly, all three were the lowest triglyceride scores I’ve ever had (my average is 91). So one more time… if you want to understand cholesterol, start by understanding how your cells get their energy! Otherwise you’ll keep looking at the passengers and not the drivers. I don’t recall that you’ve mentioned caffeine. Do you drink coffee/tea/etc.? If so, do you expect any particular impact due to any effects on lipid metabolism? The caffein is more off-and-on. I don’t drink coffee or energy drinks of any kind. When being lazy, I’ll have a Coke Zero and/or stevia-sweetened ice tea. But lately I’m avoiding both and trying to stick to water. It’s tough, because I definitely consider sweetened drinks one of my biggest lifelong addictions. I’m interested on what (if any) impact this would have on my lipids — but skeptical that it would be of any significant degree. The research I have read indicates that coffee raises LDL C by about 10% and Green Tea lowers it by about 10%. My personal experience was that this was pretty much the case. A little self experimentation should answer your question. Interesting — I’ll have to check into that. Maybe I’ll work in an experiment using lots of ice tea at some point. Hi Dave, Great talk and interesting data. As you can gather from my previous comment I am a bit of a data scientist myself with an interest in this area. One thing that readers might benefit from, which unless I am mistaken is not on the site although I admit I have only had a cursory look around, is an example of what you ate on the 3 day test. 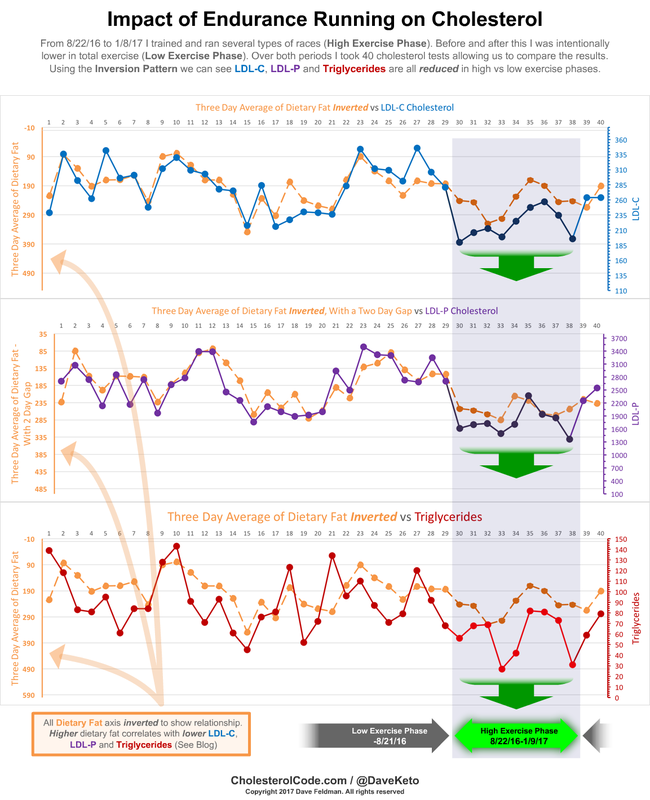 A lot of people may find the figuring out of fat to carb ratios a bit time consuming whereas a sample 3 day diet would be a useful shortcut and no doubt attract more data. You would also have the added benefit of controlling the input data more closely. Yes — that’s been suggested before. I think I’ll see if I can work up a post soon where I detail a lot of the things I’ve eaten both in and out of experiments. Hopefully that would be helpful. In this article you also touch on sheer stress. As a 10k runner myself or should I say ex 10k runner this interests me. These days I lean in the direction that increased blood circulation causes sheer stress at major junction points and this damage promotes repair and plaque build up. The irony is that if we do zero exercise that too appears to be unhealthy. Some research has shown that the sweet spot is only slightly above couch potato ie the walk to work and back type. What are your thoughts on this ?. That’s a pretty long subject for me. While I know branch points are often pointed to as reenforcement to the Lipid Hypothesis, it seems to ignore pathogens and ROS follow the same rules of physics. So cellular turnover there, and for that matter, atherosclerosis is not that unexpected mechanistically. I certainly believe extreme athleticism has problems, but I’m skeptical cutting out 10ks would be a net gain, for example. I’m more likely to think it would be helpful more than hurtful. Yes, I’m excited to watch the interviews! It’s a really great group of people in the organization as well. Hi, this probably isn’t the best place to ask, but couldn’t see where else to! What effects have you noticed on HDL-P in all your experiments. I just found out mine is low, despite HDL-C being high, on a LCHF diet. I also think my LDL went up on LCHF – only just had an NMR once, so can only compare total and calculated LDL-C between diets. I have a family history of dementia but don’t know apoE4 status. My HDL-P has been consistently slightly below range. 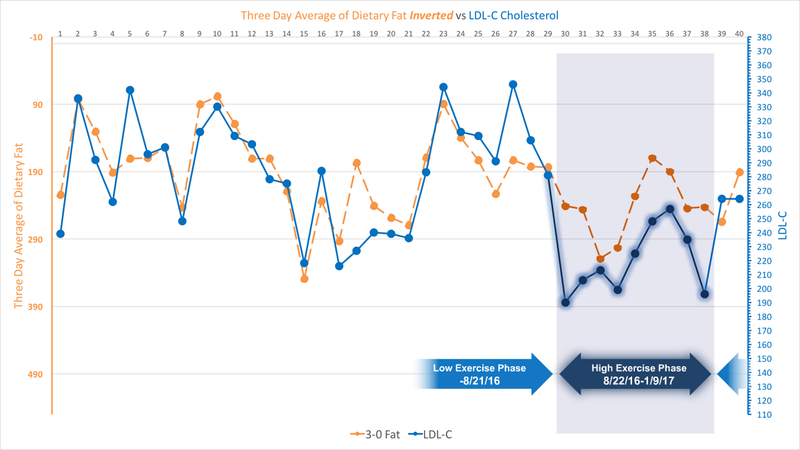 And as HDL-C rises with total fat, HDL-P likewise rises with total fat — but on the same *particle* pattern (5 days with a 2 day gap) as LDL-P. Very interested in all of this… I’m a recovered T2DM – dx’d on July 5 2016. Went keto, dropped 80+lbs, most recent hba1c came back as a 5.2. 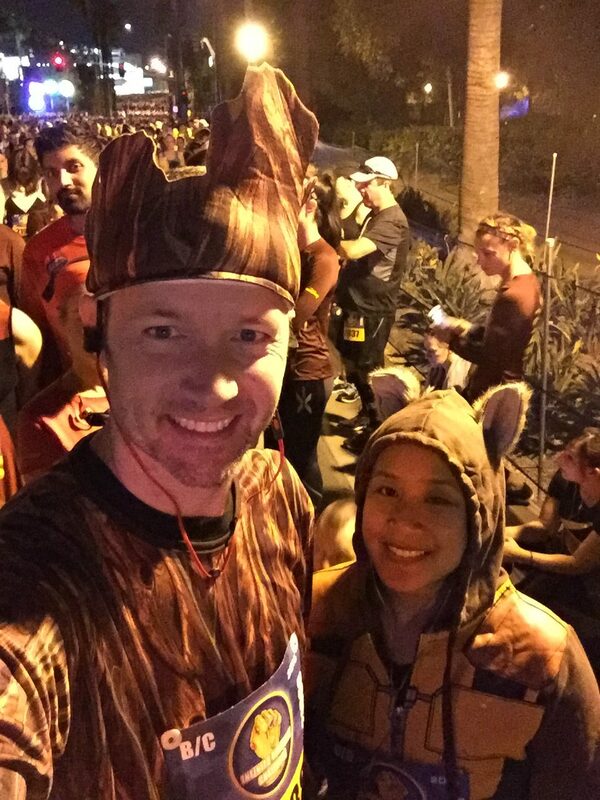 She was insistent that this is horrible and I must reduce my meat consumption and increase exercise…. She is blaming the meat consumption for the LDL and saying a lack of exercise is the reason for the low HDL. In any given 7 days I workout 5 or 6 of them. I lift weights, run, and row. As far as the rowing and running I do a combination of interval training, slow and steady cardio, and high intensity… So I called her out on the exercise stuff, she didn’t have any response. She ordered another set of tests for 3 months out. I’ve got another 15 or so lbs of fat I could drop, figure I’ll focus on that for the next couple months, then likely figure out your protocol to hack my cholesterol score for the test. You are likely a hyper-responder like myself. Which means while being keto, you’ll likely have higher LDL-C markers. But I’m less concerned about your LDLc than I am your HDLc, which is usually much higher on a ketogenic diet. I literally just completed a five month experiment that compares a large set of data where I was distance running with the previous set where I was mostly sedentary (9 months). My HDLc was not significantly different. 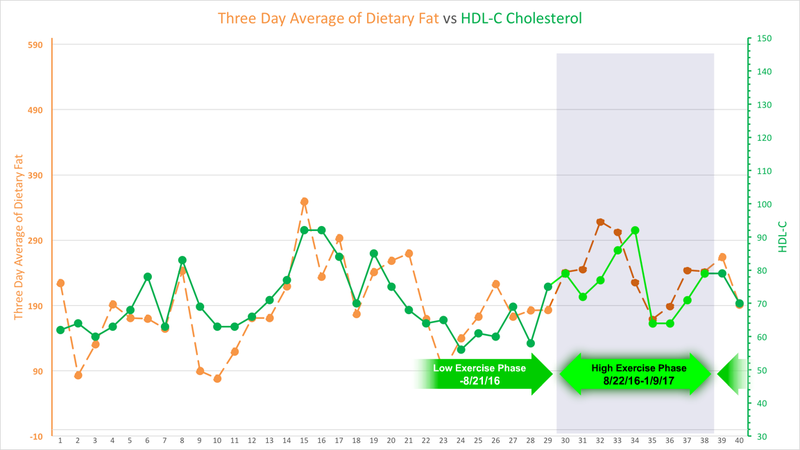 Thus far in my own numbers and in the other N=1 research other people have sent me, upping total dietary saturated fat appears to be the most effective way to increase HDLc. I have a similar problem, but different question. Everyone says you can’t eat to much fat, however I’ve been on Keto for more than 9 months and my cholesterol doesn’t get any better. I will admit I really like butter, put it on everything. I have probably been consuming a half stick a day along with whipping cream & coconut oil in coffee & eggs. I eat meat, chicken, brauts & pork. Like John I have my Doctor upset with me and wanting me to change my diet! After reading others who’s LDL’s & Triglycerides have dropped???? I do need to add I never started this to loose weight, I’m 5″ 9″ 175 lbs. had problems with joint pain, so bad I was in therapy last year at this time. I’m in the best shape of my life (in my mind) and no joint pain with a slew of other bennies from Keto, Just a little concerned. So to be clear the question is, Can I eat to much Fatty stuff? Dang! In seeing George’s comment below, I just now saw JD’s. (This happens sometimes when a comment is left a bit of a while after the article was posted)… JD — I’m going to ping your email to let you know I’m responding. Your profile doesn’t appear to reflect a common outcome with going keto, so it is possible you are having too much fat. That threshold is harder to pass on keto, but there’s a lot of personal context to it. This might help with the why of LMHR,.the evolutionary rationale. if you were fasting and hunting lean you would have higher LDL-p – and you could expect to be injured or suffer wear and tear eventually, where it becomes useful. In that model, it’s a “just in case” arrangement, favoured by natural selection because burning more fat means more danger or damage. Conversely, being overfed means less risk so it’s okay being low. Note that there’s some amount of upregulated VLDL activity via lipolysis that was certainly in play in my running, but probably unaccounted for by the test I was taking 24 hours later. In other words, if I could have been taking constant lipid tests with my CardioChek following the race and every hour afterward (don’t think I won’t do it some day! ), then I’d speculate I’d have a temporary boost in my TG and LDL. So truly, this is the most obviously direct inducement of the handy LDLps on hand for repair as well. How would weightlifting play into this experiment…would you expect it to have a similar affect? I would think that weightlifting requires more repair work, so it might have a more pronounced effect on the ldl, but doesn’t require as much total energy, so maybe a lower effect on the triglycerides? As an aside, I don’t have it handy, but there are already some studies on this. The catch is that they aren’t as controlled as mine are with regard to dietary influence, etc. I am going to be getting a blood draw on Friday. I plan on doing the first/simplest protocol for it and submitting my results (along with a 9 month old baseline level if that helps). So I’ll plan to do strength training on the wednesday and thursday before the draw. Also, on a side note, I’m doing a month of carnivore/zero carb eating, so I won’t be adding macadamia nuts or anything like that into my eating. Do you think adding butter would be a reasonable way to increase the fat calories during the 3 days prior, or do you think I should specifically try to get additional fat from beef, etc? Cool — always happen to get new data. Yes, butter would likely be just fine. In private correspondence you referred me to this article which you felt best explained your theory of lipid and cholesterol. No doubt the hard exercise phase underscores your concept that dietary fat and plasma cholesterol are essentially inverted in the short term. Your explanation of the lipoprotein system as a lipid delivery system first and foremost with cholesterol as a passenger makes eminent sense so increasing fat may indeed result in less plasma cholesterol through the same cholesterol ride sharing with more fat so as the LDL stored fat is absorbed so is the cholesterol and plasma levels drop. So far so good. So let’s call this the DYNAMIC phase. My problem understanding the basic relationship of fat to cholesterol concerns the BASELINE phase. By this I mean adoption of the LCHF diet so if you go from a typical SAD diet to LCHF carbs decrease, protein stays about the same but fat increases a lot. In this case, the relationship seems to invert, except for TG, in hyper-responders whether LMHR or regular. To summarize, in hyper-responders the following seems to occur. This is the bit I was trying to sort out in my post in the LMHR section. The mechanics seem to be different in the two cases. My opinion was and still is that BASELINE changes are due to fatty acid profiles and it has long been known that appropriate changes in saturated fat, polyunsaturated fat and cholesterol can dramatically increase total and LDL cholesterol. This goes back about 50 years to Keys but includes researchers such as Hegsted, and KC Hayes, Reaven, Grundy and others who have produced equations that predict plasma cholesterol from fatty acid profiles with very good accuracy. Your experiments and theories I believe are sound. You definitely do explain what is going on in the short term and I agree wholeheartedly but I still have this problem with the baseline changes that go in the opposite direction. Serum cholesterol is obviously relevant in this context because it generally “ride shares” with TG in the same “boat” (lipoproteins). And I hypothesize the reason for the Inversion Pattern is that I’m bringing up and down the body’s need to mobilize these TGs to compensate for what I’m bringing in from the diet, thus resulting in more or less VLDLs to provide it, which ultimately can remodel to LDL (of those that don’t get absorbed as IDLs via the liver). So why do some who go on LCHF see their LDL cholesterol go up and some don’t. I submit that the largest and most correlative association of all is how lean and/or athletic they are (per my identification of the LMHR profile). This isn’t a hard rule, but it does certainly appear to carry the most common association thus far. To get to the core mechanistic aspect of all of this you need to note how LMHRs could have both high LDL and low TG. The LDLc almost always correlates to the LDLp (more of both). But how can you have so many LDL boats, yet so little TG cargo at the same time? I submit it is _greater usage_. That if we could track _secretion_ of VLDLs for LMHRs, we’d find they are circulating many more of these “boats” relative to a carb-centric athlete (assuming little DNL). And as such, they will end up with a higher quantity of the later stage LDLs. And this is more pronounced as you get leaner and have less adipose mass because it necessitates more of these fatty acids must be circulated and provided from far away (the liver). More TG delivery via VLDLs globally vs delivery of NEFAs locally. Should I do my normal 4 mile run the morning of my blood test? It may not be a good idea if you’re seeking the most accurate results – the run could impact various values on the test including CRP, LDL, and LDL-P if you get an NMR Lipoprofile. It may be better to take it as a rest day the morning of, and the day before, and take a relaxed walk instead. Have you had your VO2max tested? I don’t see anything in here about your heart rate during “Endurance Training”. Personally, I view endurance training as training that happens at a fairly low heart rate and burns mostly fat for fuel. This is represented by an RER or RQ of around 0.7. A VO2max test would tell you what your RER rate is at a particular heart rate. I’d be particularly interested in knowing the changes to lipid with this characterization. For instance, I can go out for a mixed slow jog/walk and keep my heart rate at my max fat burning level (around 120 bpm). I can do that exercise several times a week and I’m oxidizing the maximum amount of fat (and little to no carbohydrates) during that time. Equally, I can go out and mow the lawn on a warm day with a heart rate monitor and be at 90% of my max heart rate for 20 minutes. That’s a largely glycolytic effort – burning mostly carbs and little fat. I think it would be worthwhile to understand lipids with these points in mind. I only do endurance training (as described above) because I choose to train to my diet rather than eat a diet to my training. Great suggestions. I may try some of these in the coming months as I work my way back into more overall exercise.